Donnie Darko: Where Are They Now? DONNIE DARKO launched the careers of some of our best-loved actors, and is officially a fully fledged cult classic. But what are Donnie, Gretchen and Cherita up to now? After DONNIE DARKO, Jake Gyllenhaal went from strength to strength in films like ZODIAC, BROKEBACK MOUNTAIN, ENEMY and NIGHTCRAWLER (let’s just forget the misstep that was PRINCE OF PERSIA). He is a bona fide Academy Award® nominated movie star, but will always be remembered as the time traveling teenager with a creepy bunny friend. Maggie Gyllenhaal is a B.O.S.S. She nailed roles in films like THE DARK KNIGHT, and who could forget her in SECRETARY? Like her brother, she has also been nominated for an Academy Award® and recently won a Golden Globe for her incredible role in THE HONORABLE WOMAN. Although DONNIE DARKO isn’t the film that made Drew Barrymore famous, it is one of the first films her company Flower Films produced. Since the DONNIE DARKO came out, Drew has been involved as a producer on other projects like WHIP IT!, MUSIC AND LYRICS, HOW TO BE SINGLE and CHARLIES ANGLES, and has acted in the films MISS YOU ALREADY, and 50 FIRST DATES. Noah Wyle was the resident hottie in DONNIE DARKO. Well known for his role in the TV series ER, he has acted in a string of made for TV movies and short lived TV shows since he was in DONNIE DARKO. He has also starred in one of our favourite TV shows, DRUNK HISTORY… who doesn’t love people trying to remember what they learned in High School while inebriated? Jena Malone is probably best known for her role in the HUNGER GAMES series, but she has also starred in many other well known movies like PRIDE AND PREJUDICE, THE UNITED STATES OF LELAND, and SUCKER PUNCH. Seth Rogen’s first speaking role in a film was in DONNIE DARKO. His line “I like your boooooobs” feels like it set up the path his career would take. We absolutely love him in TV shows like FREAKS AND GEEKS (only one season was a crime), SUPERBAD, PINEAPPLE EXPRESS, KNOCKED UP and his dramatic turn in STEVE JOBS. His bro-mance with fellow weed aficionado James Franco is well documented, and we look forward to everything they do together… Aha honey. Ashley Tisdale is barely recognisable in her role as the ‘Dorky Girl’. She of course went on to become an ‘it girl’ after her starring role in the HIGH SCHOOL MUSICAL trilogy, and has provided the voice to characters on shows like FAMILY GUY, KIM POSSIBLE and THE CLEVELAND SHOW. Patrick Swayze’s career defining role was in DIRTY DANCING, and had a successful career in Hollywood before and after DONNIE DARKO was released. Unfortunately he passed away after being diagnosed with pancreatic cancer in 2009. 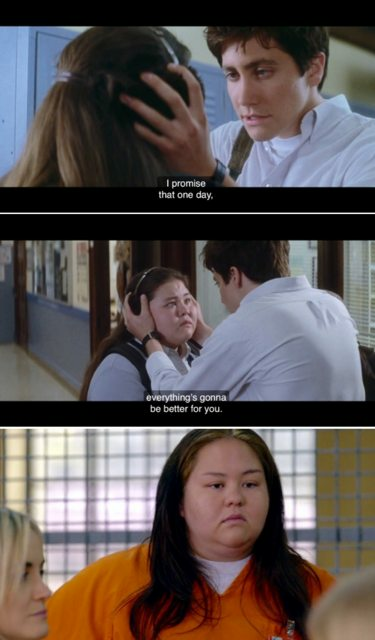 If you haven’t seen the DONNIE DARKO/ORANGE IS THE NEW BLACK meme featuring Cherita Chen then do yourself a favour check it out here. Since 2001 Jolene Purdy has become known for her roles in BENCHED, UNDER THE DOME, and she has recently started getting attention again for her role in ORANGE IS THE NEW BLACK. Since DONNIE DARKO was released, James Duval has acted in smaller roles on the big screen, but none are as nightmare-ish as his role as Frank! Since schooling children on the difference between fear and love, Beth Grant has enjoyed a lot of time on classic shows like DEXTER, PUSHING DAISIES, MODERN FAMILY, THE OFFICE, and has loaned her voice to a character on KING OF THE HILL. She is currently starring as a series regular on THE MINDY PROJECT. Can you believe it has been 15 years since DONNIE DARKO was released? Pick up the 15th anniversary edition of the DVD and Blu-Ray, and also watch it for the first time on digital from July 6!